It’s no secret that the winter can be harsh on your lawn. By protecting your lawn now, you are promoting healthy growth for the spring. The time to think about a lush lawn is now. Here are the steps you should take in order to get that green lawn your neighbors will envy once winter ends. Getting rid of leaves and debris in the lawn prevents disease and decay from getting trapped under the snow in the winter months. It could cause major damage to the grass and plants if leaves were covering them throughout the summer. 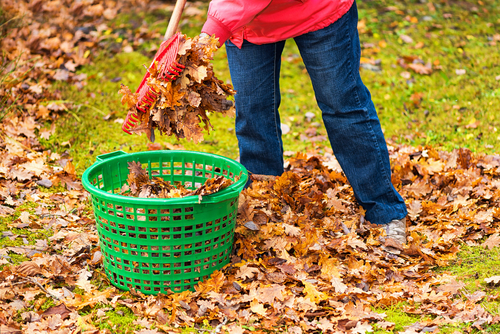 By raking, you are protecting your grass the best your can in preparation for the winter. By using winterizer, a fertilizer designed for use in late fall, you are allowing the grass to store more food for the winter, as well as encouraging rapid growth and rooting in the spring. This is the best way to protect your lawn from the harsh winter temperatures as well as prepare it for success once the weather warms up again. Cool weather grass will do best in the north because of the colder temperatures. By getting the seed in the ground early, it gives the grass a better chance at surviving the winter months and being ready to grow in the fall. Your lawn will thank you by seeding the lawn earlier on. Come spring, you will already have a lush, green lawn in the works. Once your lawn is rid of leaves and full of new seed, it’s time to water the lawn. This gives the seed a head start on growing. It allows the roots to set in the ground and start growing before the worst of winter hits. These precautionary measures are key to achieve a beautiful lawn in the spring. The more you prepare your lawn now, the better it will look in the warmer months. If you would like T&B to assist you in winterizing your lawn, please visit our website, www.tblawncare.com, to see what we can do for you. No Replies to "How to Winterize Your Lawn"